Look Mom: No hands on the wheel, or eyes on the road! What is normally a dangerous activity in a vehicle is arguably dangerous no more. Hyundai demonstrated – spectacularly – just how well an autonomous, or self-driving, vehicle can navigate and negotiate the busy Las Vegas streets mere days before the opening of CES 2017. Joined by other media and industry analysts from around the world, I managed to grab a seat in the back of Hyundai’s autonomous Ioniq concept hybrid vehicle. Actually, I needed to elbow my way in – I wasn’t the only one who couldn’t wait to try the Ioniq out and get a sense of what the future of transportation might feel and look like in a driverless car. My first impression even before driving off: surprise, by how normal the Hyundai Ioniq appears, both on the outside and inside. Sure, there are more sensors and features on the inside windshield, front bumper and dashboard, giving the vehicle the power to see and sense – or provide feedback to the driver behind the wheel. The high-tech features that help the vehicle navigate are tucked away in the bumpers or behind the front mirror. Riding as a passenger or seeing it on the road, I quickly realized that most people would never know that there’s no human driving it. What was most striking about my “ride” (which is what we should be calling it) was how normal it was; no erratic shifting in lanes, jerky motions, quick or super slow acceleration, or sudden braking as obstacles appear ahead of the car some distance away. My ride was smooth, natural, and safe. As it turned out, we had plenty of activity during our test ride, since our mid-morning 20-minute trip took us around the Las Vegas Convention Center, bustling with CES preparations. Pedestrians were everywhere and trucks were coming and going. One pickup truck, clearly not piloted autonomously, came flying out of a parking lot about seventy-five-feet ahead of our vehicle. Instead of a possible overreaction followed by a slam on the breaks, the Ioniq quickly and gently slowed down to provide plenty of space between us and the pickup as it cleared our forward path. Just for show to the media and analysts, a LiDAR (Light Detection and Ranging) screen was mounted in the back seat of the car so I could see what the car’s navigation computer was “seeing.” A monitor centered in the front dash board displayed the speed and other navigational information; it provided peace of mind, if nothing else. Ioniq’s driving “behavior,” if we can call it that, is by all accounts conservative. No speeding up through changing red lights, all speed limits strictly observed; it raises the question as to what traffic cops are going to do with their new free time. 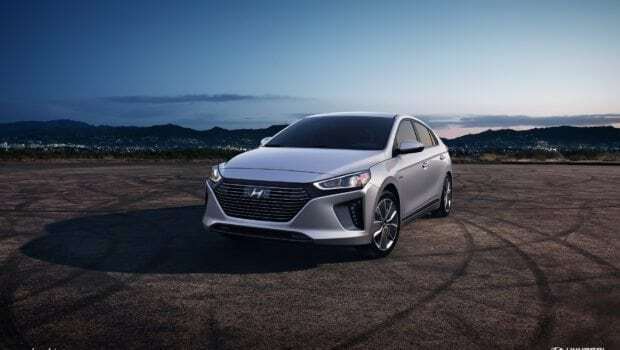 According to Miles Johnson, Senior Manager of Quality, Service and Technology with Hyundai Motor America, safety and affordability are major considerations guiding the development of Ioniq. LiDAR on the roof (noticeably absent) or additional sensors and safety features can be added as needed to meet further Federal regulations or foster greater consumer acceptance related to giving up control behind the wheel. “You’re going to see self-driving vehicles all over the place,” observed Dr. Shawn DuBravac, Chief Economist with the Consumer Technology Association (which produces CES) in a presentation later in the day. He noted the explosive growth in and significant presence of the automotive industry at CES, which now covers an entire area of the show floor where many automotive manufacturers and suppliers showing off self-driving and driver-assist technology. Honestly, I felt more at ease as a back-seat rider than I sometimes do with my own wife behind the wheel in a congested, unfamiliar urban scene. By the end of my brief driver-less journey, I really started to wonder how this convergence of technologies could transform the future of mobility for the elderly, satisfy the need for teens to safely move about without touching the wheel and, perhaps, even reverse the trend of accidents caused by texting, sleeping, or road rage by the person behind the wheel. Exactly when the autonomous Hyundai Ioniq will be available is unclear; perhaps in 2020 or so, depending on regulations and consumers’ comfort with autonomous vehicles. One thing’s for sure: when it does release, I’ll be ready. Besides writing and photographing for Innovation & Tech Today, John D. Ivanko is the award-winning co-author of ECOpreneuring and a contributor to TechSocket.net.